Latest post Tue, Oct 2 2018 3:45 AM by Alayne Holmes. 32 replies. Hmmm... Try again. The images are not coming through. Perhaps make them a different file type? Like a JPEG? Sure. Email me directly. alwaysediting@yahoo.com. Hi all. Attached here are screen grabs Sonia sent me (uploaded with her permission). These seem like standard SD "stair-stepping", and not artifacts. Probably caused by simply viewing low-res SD footage that is being up-sized to fit the HD raster. Agreed? isn't it caused by interlacing issue? because I view the time line in high res. the problem is the lines on the fabric roll the guy is carrying and other straight lines specially white lines all over the 4.3 images. 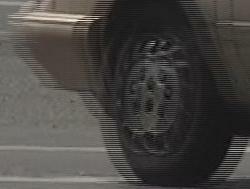 Probably caused by simply viewing low-res SD footage that is being up-sized to fit the HD raster. Agreed? Notice the combing effect of the alternate scan lines. You may see this on even relatively slow moving objects (this example's rather extreme for emphasis). (BTW, I posted a short tutorial, with images, on how to post images in the Getting Started forum, pinned to the top). how can I see it in high resolution? by the way I have the same issue as you show in the picture as well. Sorry, there is no way to see it in a higher resolution than it is. If the image was captured by a camera shooting 720 pixels wide by 486 pixels high, then that's all you get. Those artifacts you are seeing are the actual interlaced pixels. They only become smoother when played. Stretching an SD image larger, over a 1920x1080 pixel canvas doesn't increase then number of pixels in the SD image. It simply makes the pixels larger. To be honest, there's no really good way of getting rid of interlace. The best method is where the effect analyzes the even and odd lines, and then shifts left and right 1/2 the distance to bring the two into alignment. But even this isn't perfect if the motion varies over the course of 1 frame. And it requires analyzing every single frame as the motion may vary from frame to frame. Promote the motion adapter on the clip in the sequence to a timewarp. Set it to Both Fields, input source Interlaced, output Progressive, and check the Adapter Deinterlace Source option. If you can't change it, right-click on the master clip in the bin and choose Get Info. Look at the Field Motion setting. It should say Interlaced. thank you for your response. you mentioned that I should Promote the motion adapter on the clip in the sequence to a timewarp. Set it to Both Fields, input source Interlaced, output Progressive, and check the Adapter Deinterlace Source option. could you please write me the steps on how to do that. Because when I do it it won't work. I'm thinking that I do something wrong. I always get the window filter does not apply. What are the results from Get Info on the clip in question? Also are there any other filters on that clip? I imagine you are getting this error because the source clip is an interlace clip in a progressive project. Select the clip, click on the motion effect edit button (left side of the timeline), then click on the Promote button in the top of the motion effect edit window. You should now be able to follow the suggestions give. I was able to use the timewrao effect to deinterlace my footages but after I render the effect and I replay the clip the image stutters. is there a reason for that? how can I fix the problem? Do you mean the motion does a dance of going forward and then a bit backward? I am workung on a doc that has alot of mini dv footage that is interlaced. Ive been scaling it up to HD re-encoding as DNX and de-interlacing in iFFmpeg before AMA linking in the avid.